Last week, the Obama Administration released its fiscal 2012 budget to much fanfare. Unfortunately, the budget makes only a token effort to address the rising National debt, and forecasts a budget deficit of $1.1 Trillion. While the release of the budget failed to make a splash in currency markets, traders would be wise to understand its implications for the future. The budget proposes spending of $3.7 Trillion in 2012, and forecasts receipts of only $2.6 Trillion. As usual, entitlements (Social Security, Medicare, and Medicaid: $2 Trillion+), Defense ($760 Billion), and net interest on debt ($250 Billion) are projected to consume the brunt of spending. The Departments of State, Education, Energy, and Veterans Fairs will receive an increased allocation, while almost all other Departments face drastic cuts. (For more comprehensive breakdowns, the WSJ and NY Times offer excellent graphical representations of how the federal budget is funded and disbursed). The proposed budget allows for a deficit of $1.1 Trillion (7% of GDP), which unbelievably represents a significant decrease from the $1.6 Trillion (11% of GDP) that is projected for fiscal 2011. 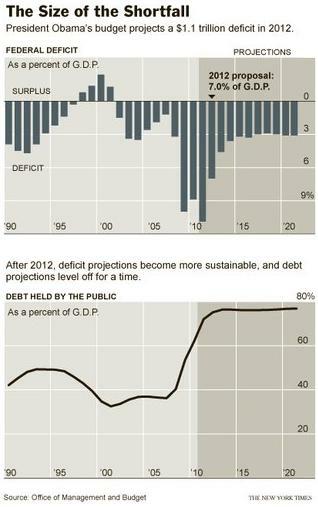 The Congressional Budget Office (CBO) forecasts the deficit to return to a more “sustainable” level of 3% of GDP beginning in 2014, which should allow the national debt to remain constant in relative terms for the following decade. Beginning in 2021, however, entitlement spending is projected to skyrocket, which would cause debt to rise similarly. CBO projections are based on a handful of rosy assumptions. First of all, it assumes that the US economy will grow at 3%+ for the indefinite future. Second, it assumes that deficit spending can be financed at reasonable interest rates. Third, it assumes that tax receipts will rise from current lows and revert back to historical levels. Given the ongoing economic uncertainty, high unemployment rates, tax cuts, rising interest rates, the difficulty of cutting spending, etc., there is reason to believe that actual deficits will be even higher. In fact, net interest payments on national debt will rise 33% over the next year even as Treasury rates remain at record lows. If the economic recovery gathers momentum (something that the budget is counting on), risk appetite and interest rates must rise. In addition, given that the national debt will probably double from 2009 to 2012, it seems likely that investors will demand an increased risk premium for lending to the US. On the other hand, demand for Treasury Securities continues to remain strong: “Net long-term securities transactions showed total buying of $65.9 billion in long-term U.S. securities in December, after purchases of $85.1 billion the month before.” Many Central Banks continue to be net buyers. In addition, there are some commentators that think the Fed will abet the US government in deflating the real value of its debt. Since the majority of US Treasury Securities are not inflation-protected, 15 years of high inflation (~5%) would be enough to decrease the real debt burden by half. Especially when you account for “contingent obligations,” this might be the only feasible way for the government to deal with its debt burden over the long-term. Then again, higher inflation would probably drive proportional increases in yield, such that the Treasury Department would have a tough time rolling over existing debt (let alone in issuing new debt) at reasonable interest rates. The main variable in all of this is politics. Specifically, this budget is still only a proposal. The actual budget won’t be ratified for at least another six months, and only after tense negotiations with the Republican Party. (There is also the possibility that it won’t be passed at all, which is what happened with the fiscal 2011 budget). “House Majority Leader Eric Cantor, a Virginia Republican, said his party will propose ‘very bold’ changes to entitlements in their 2012 budget resolution.” Anything short of this wouldn’t dent the projected deficits and would push Social Security / Medicare closer towards the brink of insolvency. 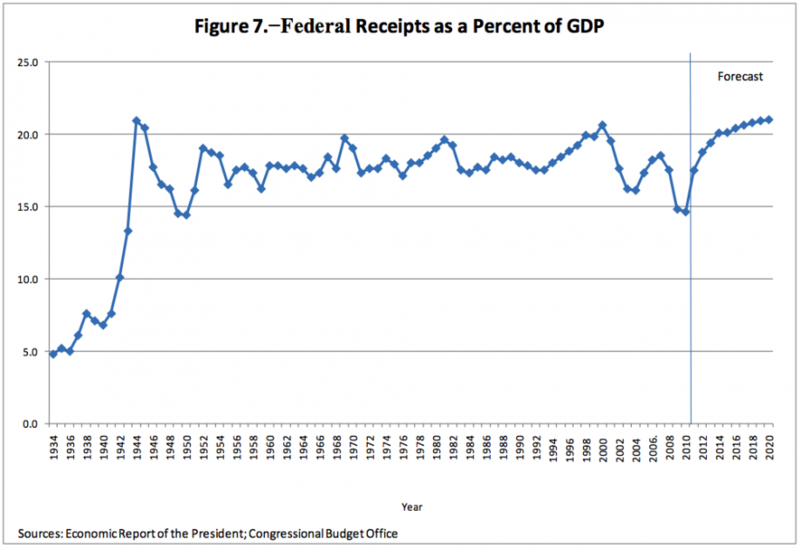 In the end, the deficit merely represents business as usual for the US government. Barring a double-dip recession, it probably won’t be enough to seriously impact the Dollar’s status in the short-term as preeminent global reserve currency. However, that could start to change over the next decade, as the government either takes steps or does nothing to mitigate the looming entitlements crisis. At that time, the long-term viability of the Dollar (and the financial system as we know it) will become clear. I was hoping someone here would know of a government website that depicts the US dollar projection for the next 30 or 40 years.